The Szabadka Initiative: AHF signs joint declaration of the Szabadka Initiative by ethnic Hungarian political parties and human rights organizations from successor states in an appeal to the Hungarian Government for more coherent support, coordinated planning, and dual citizenship. 1/4/2005 - Hungarians have until September 2005 to formally request return of confiscated properties in Slovakia under the Benes Decrees. The 1945 Benes Decrees claimed collective World War II responsibility of Germans and Hungarians living in Czechoslovakia, and deprived them of their rights, their property and expelled many of them from the country. The "Szabad Ujsag" weekly has published a list of those lands, which were taken away during the Benes programs. The original owners or their descendants may recover expropriated lands and properties if they can prove their ownership and relationships to the original owner. The validated documents have to be shown to the proper authorities. One catch is that it has to be proven before September 1 of 2005. Morton Abramowitz and Heather Hurlburt are right to urge strong U.S. involvement to help resolve the festering problem of Kosovo ["Where to Start With Europe," op-ed, Dec. 23]. They, however, do not go far enough. 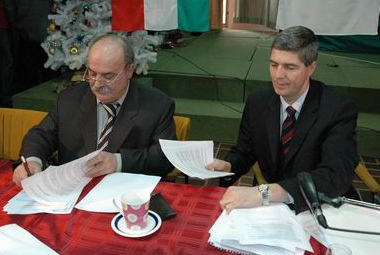 Any settlement of the situation in Serbia must include the province of Vojvodina. University of Utah gymnast Gabriella Onodi is the most improved gymnast on the team this year. Utah coach Greg Marsden and sophomore Gabi Onodi are sitting in Marsden's office, watching a tape of a gymnast neither had seen in a while, a gymnast performing elite moves with strength, confidence and crispness. A Medián felmérése szerint 6 százalékkal nott a Fidesz támogatottsága a biztos szavazók körében. Az ellenzéki párt így 11 százalékkal elozi meg az MSZP-t. A Fideszre 46 százalék, az MSZP-re pedig 35 százalék szavazna. A közvélemény-kutatásból kiderül: sem az SZDSZ sem az MDF támogatottsága sem éri el a Parlamentbe jutáshoz szükséges arányt. A népszeru politikusok listáját még mindig Dávid Ibolya MDF-elnök vezeti, ot követi Mádl Ferenc köztársasági elnök. Orbán Viktor, a Fidesz elnöke a 6., Gyurcsány Ferenc a 8. a mezonyben. In his 10 January interview with Realitatea TV, President Basescu said his country's relations with Moldova are a "foreign policy priority," Mediafax and Revista Presei Online reported the next day. Basescu said Romanian foreign policy in the last 10 years has neglected Moldova and the importance of the Black Sea region. As a result, he said, Romania finds itself "out of the game" in the search for a solution to the Transdniester conflict, despite the fact that Moldova has a "large [ethnic] Romanian majority." He said he is ready to visit Chisinau and raise these issues with his Moldovan counterpart Vladimir Voronin. "Just as we granted the [ethnic] Hungarians all the rights, we are entitled to demand that all the rights of [ethnic] Romanians be respected, whether in the [Serbian] Timoc Valley or in the Moldovan Republic," Basescu said.